Newsgur USA: Can Lula remain as candidate for the presidency? Can Lula remain as candidate for the presidency? Despite being in prison and sentenced to just over 12 years in prison, Lula da Silva remains the candidate of the Workers' Party (PT) for the elections to be held next October. But can a prisoner aspire to the presidency of Brazil? And campaign from jail? "It will not be the PT who will resign Lula to the candidacy," the national vice president of the party, Alexandre Padilha, told BBC Brazil. "The law establishes that candidacies must be registered in August, Lula's name will be there, we will follow what the law says and then the Superior Electoral Tribunal (TSE) will have to endorse it." Lula will continue to be our candidate, imprisoned or do not". The TSE could overthrow the candidacy based on the Clean Record Act that makes those who have been convicted in the second instance ineligible. This is the case of the former Brazilian president and PT candidate. Still, the process is not automatic. According to several jurists consulted by BBC Brazil, the analysis of the candidatures can take weeks because the Public Ministry and the defense need time to make their arguments. The deadline for the TSE to pronounce itself is September 17. "The analysis of the Electoral Justice can take between 20 and 25 days, during which time the candidate has the right to campaign," explains Lara Ferreira, professor of Constitutional Law at the Dom Helder Câmara faculty. The legislation, however, does not foresee how Lula could campaign while in prison. The specialists in Electoral Law with whom BBC Brazil has spoken assure that the judge in charge of the prison situation of Lula will decide if he allows him to leave prison for a few hours so that he can campaign. Or it could also allow the entry of audiovisual equipment into the prison. "If the judge refuses, the prisoner will be able to appeal to higher instances," explains Alberto Rollo, a lawyer in the electoral area. 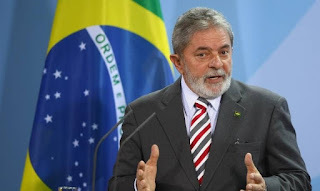 There is also the possibility that Lula will be released before the campaign begins on August 16. This could happen if the Federal Supreme Court reviews its decision to imprison Lula after being convicted in the second instance. The Court could re-evaluate the issue this week, as one of its ministers, Marco Aurélio Mello, said it will take the discussion to the plenary. On the other hand, if the Superior Electoral Tribunal rejects the registration of Lula's candidacy, the PT can still appeal the decision before the Federal Supreme Court. This would lengthen the process. In case there is no pronouncement by the magistrates before the elections, which will take place in October, Lula will be able to participate in the presidential race. If he is between the first two in the first round but is withdrawn from the elections before the second, his votes would be annulled and the candidate in third place would take the place of Lula, explains the lawyer Marcelo Peregrino, ex-judge of the Regional Electoral Court of Santa Catarina (in the south of Brazil). If at the time of the second round, the TSE has not yet made a decision and Lula wins the elections, the Tribunal has the right to eliminate his candidacy even after he has been elected president. "In that case, the president of the House will be the one who assumes the presidency of the Republic and will call elections within a period of 90 days," says Peregrino. For Peregrino, any of these scenarios is possible, since the highest electoral tribunal is not very quick in its decisions and Lula has the possibility of extending the process by resorting to the Supreme Court. Alberto Rollo, another legal expert, is of the opposite opinion. He believes that justice would prioritize the issue of Lula precisely because the most important position in the country is at stake.